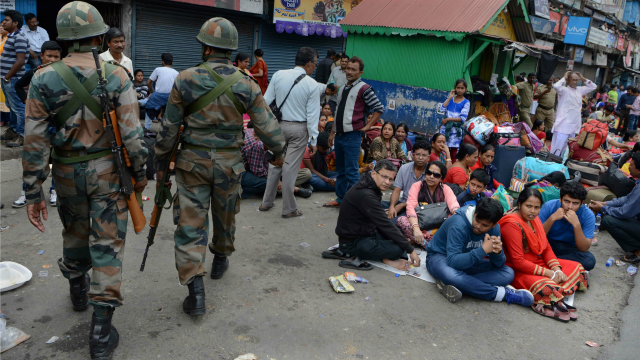 SILIGURI: West Bengal state Government has started considering heavy illegal influx from Nepal into Darjeeling as one of the major root causes of hill crisis developed around the demand of separate statehood there. The turmoil including 104 days long bandh or violent tussles have already resulted into death of many civilians as well as policemen. Discussion over illegal influx issue gained momentum after state Government found an elected councilor of Darjeeling civic body as citizen of Nepal. According to the DM Darjeeling J. Dasgupta, police is looking for the absconded councilor while similar investigation is on for three more councilors. "Many more Nepal citizens are here in senior positions," complained many senior citizens of Darjeeling. Though state government has started hitting on influx and citizenship issue now, the matter remained in air since long. Major social activists group Janachetana had brought it to Kolkata High court's cognizance in 2013. "Separate statehood demand for Darjeeling is projected as a demand for self governance of Indian Nepali speaking community. But how many of the movement activists are bona-fide Indian citizens that must be ascertained first," said Dr. D. P. Kar, President, Janachetana. According to him, under article VI and VII of Indo-Nepal treaty 1950, Gorkhas of Nepal enjoy certain civic rights in India but, not Citizenship. The Extra Ordinary Gazette notification of GOI Part 1, Section-1, Date 23rd August 1988, No. 26011/6/88-IC.I clarifies that Gorkhas, either born or resident of India for 5 years before 26.01.1950 (Commencement of Indian Constitution) only, shall be considered as citizens of India. India maintains its 1751 km long non fenced border with Nepal which citizens of either countries do not need any document to cross. "That is helping heavy illegal influx," said Dr. Kar. "This border is highly porous," accepted even the top brasses of Sashastra Seema Bal(SSB), that guards the border. As outcome, "Darjeeling district had nearly 875% growth of Nepali speaking people between 1951 to 2001 against 284% Indian national average population growth during this period," said Dr. Kar quoting Indian census figures. "This had also given an unnatural growth of near 9.5 lakh voters in Darjeeling area during 1957-99. All political parties kept eyes closed to enjoy electoral benefit out of this growth," he added. West Bengal state Government has started considering heavy illegal influx from Nepal into Darjeeling as one of the major root causes of hill crisis developed around the demand of separate statehood there.